Understated sophistication in a timeless pattern, this elegant tile will add a unique, modern and contemporary touch to any room. The Steppe Kingly White Carrera and White Thassos 9 in. x 11 in. x 10 mm Polished Marble Waterjet Mosaic Floor and Wall Tile is composed of the highest quality polished White Carrera and White Thassos. This ornate selection from our brand new Steppe Kingly Collection is guaranteed to enhance your ambiance and provide a stylish charm to your home. 0.69 square foot per piece, each piece sold individually. Piece weight equals 4 lbs. Buy online Splashback Tile Steppe Kingly White Carrera and White Thassos 9 in. x 11 in. 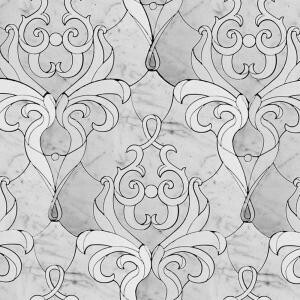 x 10 mm Polished Marble Waterjet Mosaic Tile STPKNGWTCR, leave review and share Your friends.